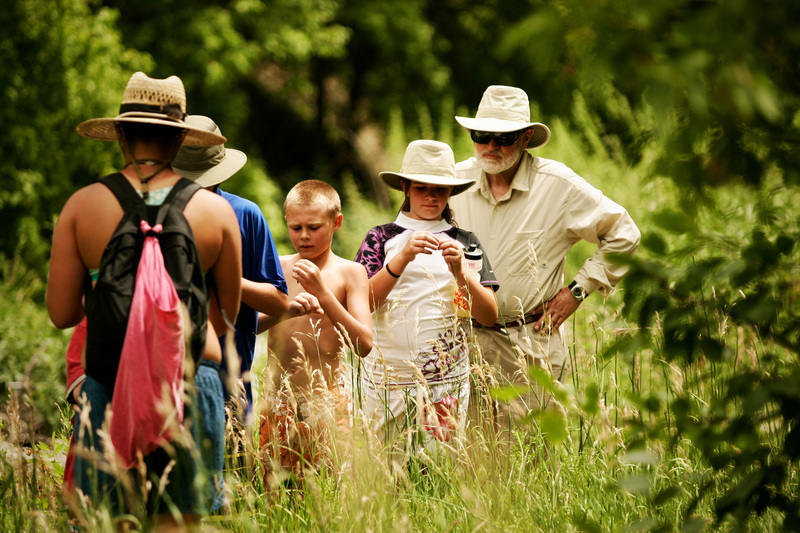 Learn About Hiking During a River Trip - One Step at a Time! While cradled in a raft riding the flow of the river is not a bad way to commute through life’s natural wonders, at some point restlessness kicks in. If you are like me, the “active” part of a trip is as important as the company, the food, and the weather. 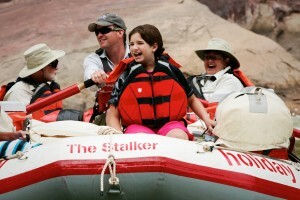 That’s why the hiking threaded throughout the Yampa River Trip balanced out the rapids-induced adrenalin with a healthy dose of endorphins for our family river trip and simply gave us a chance to stretch our legs. 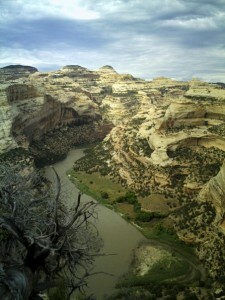 The 40-plus miles of the Yampa River are punctuated with hikes, guaranteeing excursions each day on the river. Of course, the swiftness of the river (determining hours available to be on land) and the designated campsites determine which hikes are available. I hiked some of these trails with multiple generations, from seven-year-olds on up to seventy-year-olds from our group—everyone does it at their own pace and guides spread out, accounting for everyone. For those of us who want to put in more footwork, some hikes can be extended. Often there is a cool “find” at the end of a hike, but really the cliché, “the journey is the destination,” is apropos as you spot wildlife and soak in the natural beauty along the way. For a sketch of what to expect hiking-wise along the Yampa River, grab your water bottle and follow along. These are some of the hikes, not all of them. Just 1 ½ miles from put in is the Veil of Tears hike, near Disappointment Draw enjoy a mile-roundtrip jaunt up a gradually steeper ascent of slick rock allowing for a view of the river gorge below. Some 4 ½ miles down the river from the put in is Anderson Hole Campsite, where after lunch a quick scramble (kids love this) over to the Stubbs Cabin offers a blast from the past. This old homesteader cabin is dug into the hillside and contains some relics from the past. The canyon behind the campsite offers a quiet desert hike, with falcon and bighorn sheep, that ends only when you are ready to turn around. A mile below Teepee Rapid, on the bend is a flat area to explore. There is a primitive lean-to cabin that Matt Rash, one of the wild bunch gang, used as a hide out. He even carved his name on the beam, perhaps making it easier for the hired gun, Tom Horn, to find him. Either the first or second day the raft arrives at Big Joe Campground at Starvation Valley, where the Starvation Valley Hike packs a variety of landscape into this approximately 2 ½-mile trail. The riparian area and the thunder of rapids eventually gives way to desert plants and the sheer cliffs of canyon walls—perfect waterfall perches in rainstorms. The initial ascent brings you to the top of what would be a beautiful spot for a flash-flood waterfall (100 ft.). Once up top, you can look for fossils, imaginative rock formations, and feast on the scene below of the canyon and distant rapids. Another hike that veers off this area is up Starvation Valley past rock formations called the Ant Hills and then down into Warm Springs Draw, which eventually leads to the Warm Springs drainage. Most go as far as they want and then turn around. Downstream a few more miles, on the river left, is Johnson Canyon Hike with two different options. You can either take a short walk from the boats toward the canyon wall and then downstream about five minutes to see some Indian rock (pictographs) as well as early settler John Harding’s name inscribed in the rock some one hundred years ago. For a longer stretch, you can continue on up Johnson Canyon, exploring the wildlife and plants that inhabit it as the elevation gradually climbs. 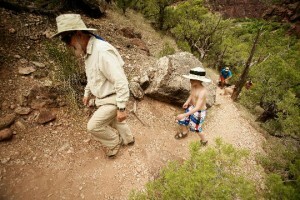 The whole experience—pictographs and the canyon hike—take about 1 ½ hours. A mile downstream is Harding Hole, where there are two excellent hikes, each on opposite sides of the river. 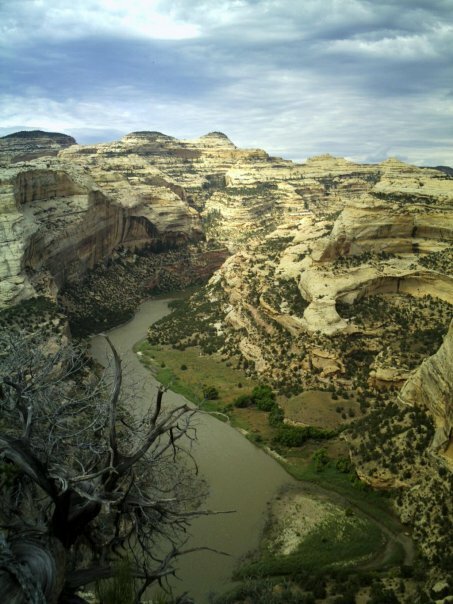 River left, at the Harding Hole Campsite, is a 2-hour roundtrip hike up onto the Yampa Bench out to Wagon Wheel Point (a big knob that looks like its name). I nice perch in which to gaze down at the river scene some 800-feet below. 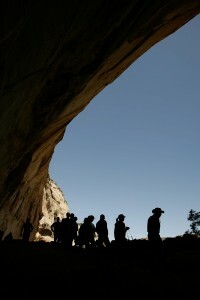 On the opposite side, is the Signature Cave Trail. This easy, 15-minute walk away from the river leads to a large, cool cave where the whole group can meander around in the shade of it and look at the hundreds of signatures from early river runners (i.e., Bus Hatch, Roy Despain) and with a good eye, some very early rock art. Another 8-mile float brings you to another massive cave (1/2 mile roundtrip) at Mantel Ranch, the only river front privately owned piece of land owned in Dinosaur National Monument . This gigantic undercut is a treasure trove of more Fremont Indian rock art. 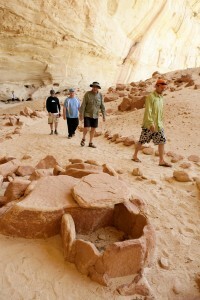 All sorts of artifacts (1200 A.D.) were found in this cave including baskets, knives, a granary, pottery, buckskin pouch and necklace, and a headdress. The cave opening is lush with wildflowers and vegetation. Head down to Warm Springs Rapid, about 4 miles above the Yampa and Green River confluence. This is a scouting stop to get a read on the upcoming rapids, but it is also a scenic view of vertical canyon wall and the power of the river carving its way down. After running the rapid, is the Warm Springs Campground, a spot worth exploring beyond the camp itself. “This is one of the most breathtaking camps I’ve ever stayed at,” admits Kerry. The second to the last day of the trip is my favorite hike—and by far the kids. 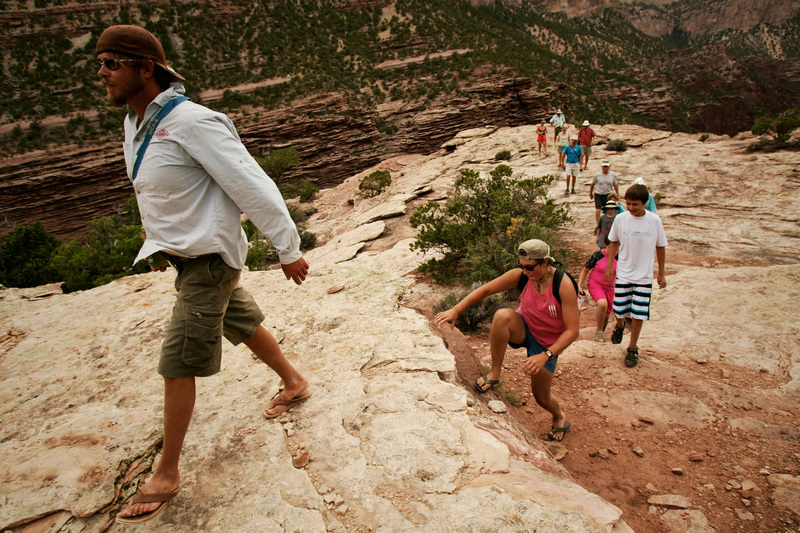 The 4-mile roundtrip Jones Hole hike is most remembered for the big waterfall at the end where guides have perfected an experience that beats the best of amusement rides. Kids love it. Adults hang onto your suits. Early on in the hike are some well-preserved petroglyphs. 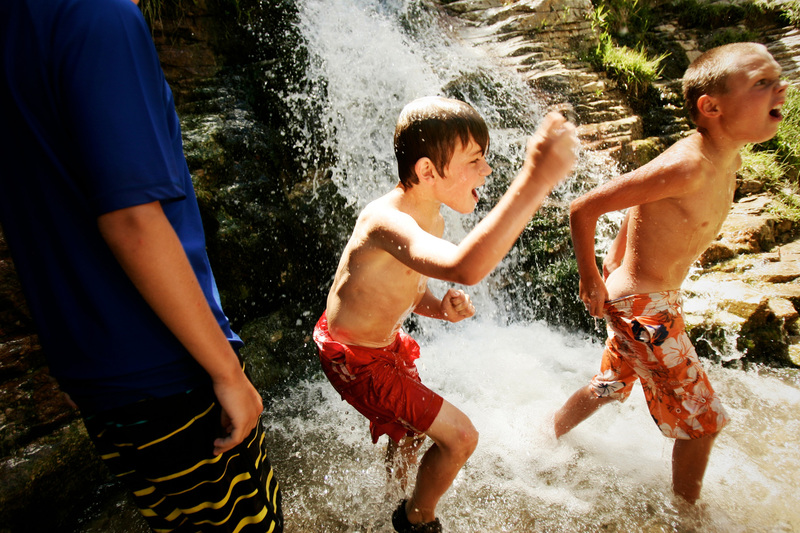 More water play is found in the stream that wanders trailside, which also offers a variety of quiet pools to cast a fishing line. 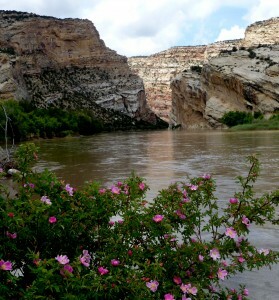 Jones Hole is world renown for their trout fishing. “When you go on a river trip, it is not all about the river—it is about the canyons and the land too, the history and the geology. The river and the hiking allow you to see it,” stresses Kerry. So pack those hiking shoes and plan to leave a few footprints, along the trail, while the experiential imprint will last a whole lot longer.